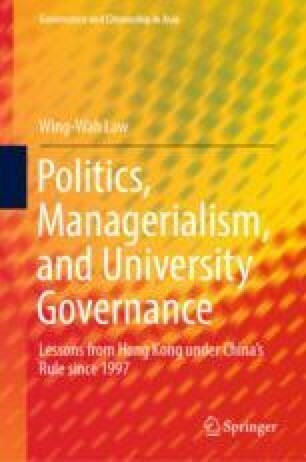 This chapter explores further the third controversial issue arising from the Occupy Central, by examining the central and local authorities’ zero-tolerance positions on Hong Kong independence, the Hong Kong government’s efforts to oppose pro-independence forces, and how these efforts have affected civil liberties in society and freedom of discussion on school and university campuses. It argues the central and local governments cannot tolerate pro-independence voices, consider the rise of pro-independence factions a key potential threat to national sovereignty and security, and have categorically defined discussions of Hong Kong independence as outside the limits of freedom of speech and academic freedom. The Hong Kong government has moved to prevent the spread of pro-independence sentiments by introducing unprecedented measures shrinking the space for pro-independence discourse, constraining social freedoms, and limiting the discussion of political sensitive issues on campuses—though their efficacy is uncertain. American Chamber of Commerce in Hong Kong. (2018, October 8). AmCham statement regarding the non-renewal of FT editor Victor Mallet’s Visa. Retrieved from https://www.amcham.org.hk/news/amcham-statement-regarding-the-non-renewal-of-ft-editor-victor-mallets-visa. Bland, B. (2018, October 5). Financial times journalist’s visa renewal denied by Hong Kong. Financial Times. Retrieved from https://www.ft.com/content/5240ecda-c870-11e8-ba8f-ee390057b8c9. Cheung, Y. (2018, August 29). Jiaoyu Weihe Wu? [What is education?]. Retrieved from https://www.facebook.com/EdUHKSUEC/photos/a.333556010043789/2018688021530571. Chinese University of Hong Kong. (2018, January 17). 17 January 2018 Statement from The Chinese University of Hong Kong. Retrieved from http://www.cpr.cuhk.edu.hk/en/press_detail.php?id=2702. Demosisto. (2018, July 17). We have entered an era of white terror. Retrieved from https://www.demosisto.hk/article/details/267. Education Bureau. (2018a, May 16). LCQ5: Issues relating to the promotion of “Hong Kong Independence”. Retrieved from http://www.info.gov.hk/gia/general/201805/16/P2018051600529.htm. Financial Times Editorial Board. (2018, October 8). Hong Kong’s move against free speech. Financial Times. Retrieved from https://www.ft.com/content/16a85b2e-ca1c-11e8-9fe5-24ad351828ab. Foreign & Commonwealth Office of United Kingdom. (2018, October 5). FCO statement on Denial of Hong Kong Visa for FT Reporter. Retrieved from https://www.gov.uk/government/news/fco-statement-on-denial-of-hong-kong-visa-for-ft-reporter. Foreign Correspondents’ Club Hong Kong. (2018a, October 5). FCC calls on authorities to explain visa decision on Club Vice President Victor Mallet. Retrieved from https://www.fcchk.org/fcc-statement-calls-on-authorities-to-explain-visa-decision-on-club-vice-president-victor-mallet/. Foreign Correspondents’ Club Hong Kong. (2018b, August 6). FCC statement on Andy Chan Ho-Tin Club lunch event. Retrieved from https://www.fcchk.org/fcc-statement-on-andy-chan-ho-tin-club-lunch-event/. Global Times Editor. (2018, October 7). Shao Yiming Yingguo Jizhe Xianggang Jiu Neidi Hua Le? [Is Hong Kong mainlandized by just one British Journalist Less?]. Huanqiu Shibao [Global Times]. Retrieved from http://opinion.huanqiu.com/editorial/2018-10/13192678.html. Hong Kong Baptist University Students’ Union Editorial Board. (2018, September 4). Xiaofang Yu Kaixueli Kanwu Shanjian Xuesheng Daibiao Jiangce [The University administration deleted part of the speech of students’ representative in the inauguration ceremony]. Retrieved from https://www.facebook.com/busueb/photos/a.426369960780538/1790241261060061. Hong Kong Government. (1997). Societies Ordinance. Retrieved from https://www.elegislation.gov.hk/hk/cap151. Hong Kong Government. (2018b, July 1). Government responds to July 1 procession. Retrieved from http://www.info.gov.hk/gia/general/201807/01/P2018070100546.htm. Hong Kong Government. (2018c, August 14). HKSAR Government deeply regrets FCC Luncheon Talk. Retrieved from http://www.info.gov.hk/gia/general/201808/14/P2018081400613.htm. Hong Kong Government. (2018d, November 6). Response by CS at UNHRC universal periodic review meeting. Retrieved from https://www.info.gov.hk/gia/general/201811/06/P2018110600982.htm. Hong Kong Government. (2018e, October 9). Transcript of remarks by CE at media session before ExCo meeting (with video). Retrieved from https://www.info.gov.hk/gia/general/201810/09/P2018100900465.htm. Hong Kong Government. (2018f, September 4). Xingzheng Zhangguan Yu Xingzhen Huiyi Qian Huijian Chuanmei Tanhua Quanwen [Transcript of remarks by CE at media session before ExCo meeting, Part 2]. Retrieved from http://www.info.gov.hk/gia/general/201809/04/P2018090400518.htm. Hong Kong Journalists Association. (2018a, October 5). HKJA expresses shock at Government refusal of work visa for FCC Vice President. Retrieved from https://www.hkja.org.hk/en/statements/hkja-expresses-shock-at-government-refusal-of-work-visa-for-fcc-vice-president/. Hong Kong Journalists Association. (2018b, August 14). HKJA statement on Chan Ho-Tin Speech at FCC. Retrieved from https://www.hkja.org.hk/en/statements/hkja-statement-on-chan-ho-tin-speech-at-fcc/. Hong Kong Journalists Association, Hong Kong Press Photographers Association, Independent Commentators Association, Journalism Educators for Press Freedom, Ming Pao Staff Association, Next Media Trade Union, & RTHK Programme Staff Union. (2018, November 9). Joint statement: The death knell for freedom of speech in Hong Kong. Retrieved from https://www.hkja.org.hk/en/statements/joint-statement-the-death-knell-for-freedom-of-speech-in-hong-kong/. Hong Kong National Front. (2018). Laing Songheng Xiansheng Jiaru Bing Danren Fayanren [Baggio Leung joined us and served as a spokesperson]. Retrieved from https://www.facebook.com/HK.NationFront/posts/2200995536808811. Hong Kong Polytechnic University Students’ Union. (2018, October 4). Xiaofang Guisuo Zhanzai Gaoqiang Jujue Yu Tongxue Duihua [The University administration dared not face us and refused to discuss with students]. Retrieved from https://www.facebook.com/hkpusu/posts/1898706833545971. Hong Kong University Students’ Union Campus TV. (2018, August 28). Inauguration ceremony for new students 2018. Retrieved from https://www.facebook.com/hkucampustv/videos/vb.279926822076021/2235111613227743. Hong Kong University Students’ Union. (2018b, September 27). The Union Executive Committee’s response on the unauthorized removal of the post on democracy wall. Retrieved from http://www.hkusu.org/en/the-union-executive-committees-response-on-the-unauthorized-removal-of-the-post-on-democracy-wall/. Kocijancic, M. (2018, October 8). Statement by the spokesperson on the refusal to renew a visa for a foreign journalist in Hong Kong. Retrieved from https://eeas.europa.eu/delegations/kosovo/51753/statement-spokesperson-refusal-renew-visa-foreign-journalist-hong-kong_en. Lam, C. (2018, July 1). Speech by CE at reception for 21st anniversary of establishment of HKSAR. Retrieved from http://www.info.gov.hk/gia/general/201807/01/P2018070100395.htm. Lee, M. H., & Tu, K. L. (2018). Xiaoyuan Zhong Buneng Chenshou De Du [Independence cannot be tolerated on university campus]. U-Beat Magazine, 134. http://ubeat.com.cuhk.edu.hk/134_coverstory/. Lockett, H., & Liu, N. (2018, November 8). Senior FT editor refused entry to Hong Kong. Financial Times. Retrieved from https://www.ft.com/content/b1bd2aec-e333-11e8-8e70-5e22a430c1ad. Office of the Commissioner of the Ministry of Foreign Affairs of the People’s Republic of China in The Hong Kong Special Administrative Region. (2018a, October 6). Office Spokesperson: Visa Matters Shall be Handled by SAR Government in Accordance with Law. No Foreign Country Has Any Right to Interfere. Retrieved from http://www.fmcoprc.gov.hk/eng/gsxw/t1602315.htm. Office of the Commissioner of the Ministry of Foreign Affairs of the People’s Republic of China in The Hong Kong Special Administrative Region. (2018b, August 14). Statement of the Commissioner’s Office on Condemning the FCC Hong Kong for Inviting Hong Kong Separatist to Make Speech. Retrieved from http://www.fmcoprc.gov.hk/eng/gsxw/t1585245.htm. Pan-Democratic Legislative Councilors. (2018, October 5). Qianglie Qianze Gangfu Jinshou Zhonggong Hongxian Zhengzhi Daya Xianggang Waiguo Jizhehui [Strongly condemns the Hong Kong government for keeping the Communist Party of China’s Red Line and politically suppressing foreign correspondents’ club Hong Kong]. Retrieved from https://zh-hk.facebook.com/CharlesMokOffice/posts/1976370932430224. Roantree, A. M. (2018, October 5). Hong Kong press freedom in question as FT journalist denied visa. Retrieved from https://www.reuters.com/article/us-hongkong-politics-visa/hong-kong-press-freedom-in-question-as-ft-journalist-denied-visa-idUSKCN1MF0XH. Secretary for Security. (2018a, September 24). Jiu Xingshi Shetuan Tiaoli Fuyu Quanli Huijian Chuanmei Kaichang Fayan [Speech on exercising power under Societies Ordinance at the beginning of a media session, 24 September]. Retrieved from https://www.info.gov.hk/gia/general/201809/24/P2018092400544.htm. Secretary for Security. (2018b). Societies Ordinance. Gazette, 22(44). https://www.gld.gov.hk/egazette/pdf/20182244e/egn2018224452.pdf. Society for the Study of Hong Kong Independence, Student Union of the Chinese University of Hong Kong. (2018, January 12). Xianggang Duli Yanjiy Xuehui Zhaomu Ganshi [Recruitment of committee members for society for the study of Hong Kong independence]. Retrieved from https://www.facebook.com/CUHKSecrets/posts/1400359153401529:0. Students’ Unions of Higher Education Institutions in Hong Kong. (2018a, June 12). A lost battle is a battle one thinks one has lost—A letter to all citizens of Hong Kong from students’ unions of higher institutions. Retrieved from https://www.facebook.com/hkusupage/posts/1763496313708859. Students’ Unions of Higher Education Institutions in Hong Kong. (2018b, July 1). One country two systems: The castle in the air will soon tumble down—July 1 declaration. Retrieved from https://zh-hk.facebook.com/hkusupage/photos/pb.509449175780252.-2207520000.1530500570./1791985410859949. Tai Kwun Centre for Heritage and Arts. (2018a, November 8). Media statement. Retrieved from https://www.taikwun.hk/en/taikwun/press/press_release. Tai Kwun Centre for Heritage and Arts. (2018b, November 9). Statement from Timothy Calnin, Director of Tai Kwun. Retrieved from https://www.taikwun.hk/en/taikwun/press/press_release. Tai, S. (2018, May 7). Guojia Zunyan Mianqian, Yingdui Gangdu Shi fazhi Zhongquan [Handle Hong Kong independence with strong punch for protecting national dignity]. China Central Televison. Retrieved from http://opinion.cctv.com/2018/05/07/ARTISrKJzLMFrPNVpbwyB9ic180507.shtml. Wang, Z. (2018, April 6). Zai 2018 Quanguo Lianghui Jingshen Fenxiang Luntan Shang De Zhuti Yanjiang [Keynote speech at the sharing forum on the two sessions in 2018]. Retrieved from http://www.locpg.hk/jsdt/2018-04/07/c_129845003.htm. Xi, J. (2017a, July 1). Address at the Meeting Celebrating the 20th Anniversary of Hong Kong’s Return to the Motherland and the Inaugural Ceremony of the Fifth-Term Government of the Hong Kong Special Administrative Region. Retrieved from http://news.xinhuanet.com/english/2017-07/01/c_136409940.htm.